When I was young, my sister and I would always have similar clothes especially during Christmas. My mother would buy or have us customized dresses that would make us look like twins. Sometimes, it’s annoying but mothers are mothers. You’ve got to love their choices for their children. Unconsciously, I did it too but on a higher degree. Haha! Look at Adrian’s 4th birthday family picture. I bought those clothes from three different stores. Effort! There are still more in my hard drive but I’ll just update it when I find them. Keep laughing! Time flies so fast! I miss the time when I cuddle my babies and play with them. Looking at their pictures when they were young make me remember what they look like when they were little. That’s why I take a lot of pictures whenever and wherever I can. So kids please don’t resent your parents taking selfies with you or taking your pictures while you are doing crazy stuff coz moms are more sentimental than dads. Why do dads like to play rough with kids? And kids would love it when their hearts feel like it would burst due to excitement. Mich loved it when dad would throw her up in the air and catch her. Her reaction would be like a mixture of crying and laughing. Then she would ask for more and dad would give up because of tired arms. The last picture was one of the acrobatic plays they had that she carried on til now. Life’s been hard the past few weeks. If there’s food that would best describe what we’ve encountered last couple weeks, it would be salad, with its sweet, salty, sour, crunchy, juicy, cheesy, olive oily and flavorful characteristics. We’ve experienced pain and joy the same day when my husband was talking about funeral for his mother after Adrian got his certificate of promotion to high school. Anyway, God knows exactly what we need. We needed time to breathe and laugh and spend time with friends so here it is. Everytime we pass by I-15 North to Carlsbad, we always see this place, Carlsbad Lagoon, and thought it would be fun to try it one day. It was such a fun-filled day spent kayaking, stand up paddle boarding, boating, wakeboarding and water tubing. The most thrilling and enjoyable part is when you mix screaming and laughing while gripping on the handle so you won’t fall on the water. Watching us slammed our bodies against the tube every time we were pulled to the curve and waves splashed on us, our cheerers laughed because of the entertainment we give. Adrian got to try wakeboarding due to my insistence. He got sore arms and he was not in the mood after that. If an angry stare could harm. Haha! I felt guilty (I know it killed his joy when we were in the boat) for letting him do it but at least he had experienced wakeboarding. Maybe he needs to workout and strengthen his upper body and arms before doing it again. Living in California for a few years, I am still not used to cold water. I’ve always wanted to do kayaking and paddle boarding so during the almost 100s (F) in May I was brave enough to consider trying them out. Perfect day to do it now in the summer with friends from Utah. I got to test my injured right arm for paddling and it was good. I think we can do the open water kayaking in La Jolla next time. Mich decided to just be a passenger if you will notice. She doesn’t want to paddle because she wants to look for fish. Below, yay! I’m getting there! This was the best that I can do for now. I need more calm waters. The waves from jet skis and boats make it difficult for beginners like me to stand up and I am not willing to fall. At least I can navigate. We enjoyed the beach, sand, sun and water for more than three hours of playtime, we were hungry and ready to eat bratwurst and sauerkraut. It was May 1st when Laurence and I learned about the pregnancy through a home test kit. We were looking discreetly at each other from time to time with winks and smirks and some pinching here and there. I felt so happy, excited, overwhelmed and the I-can’t-believe-it-is-still-possible feeling. I was scared to be pregnant because of my lower back problem that has been a struggle since I gave birth to Michelle more than a decade ago. I used two brands and did three tests in two days to make sure I was not dreaming. When my husband and I went to an OB Gyn two weeks after my home test, we saw the most exciting ultrasound ever. Seeing the little bean inside my womb flickering with a 129 bpm, I can’t hide my smile. I am really confirmed pregnant and that was the happiest feeling. For more than two weeks we kept silent about the news of our baby to our two kids. We want to break the news after the final confirmation and show them the ultrasound video. It was hard to tell Michelle since she wants to be the youngest in the family and the idea of having another baby would break her heart. She was teary eyed upon learning of the great news. She was hiding her emotions but later on accepted the idea of welcoming a baby. After that she was the most excited person in the house to welcome our baby which was due January 6, 2014. So that night we celebrated over dinner at Haiku Teppanyaki in Pacific Beach. I had a somewhat difficult but manageable first trimester in the sense that I can’t prepare food for my family. My olfactory receptors are very much on the loose and actively working, telling me to hide when someone’s cooking. Even the cutest of spring flowers from afar can’t hide it’s smell from me. Bad and good smells are the same for me. I can’t even tolerate the scent of hand soap. The food that I love eating before would be unpleasant for me but noodles of any kind seemed irresistible. Everyday we would talk about the baby. I would envision my baby to be very active like Dash in the movie The Incredibles. I know that baby would be so active and we’re excited no matter what. We talked about situations where the baby would get all of Adrian’s airplanes and Michelle’s teddy bears and scatter them all around the house. I would imagine the baby getting any pen or marker and doodle in our white leather sofa. I see the baby would be interested in plucking the strings of guitars, violins and ukuleles and play some notes in the piano. I visualize the baby would be amused by the noise the plays that Finn and Cake (our parakeets) would make. Even in the craziest possible scenario, I love the idea of having a little baby here around us and we are prepared and ready to embrace the crazy world of raising him or her. I can’t imagine if I would be able to be as disciplinarian as before. Many times I would talk to myself about the possibility of myself pampering the baby and let my husband be the one doing the “rod thing”. But that’s just a thought, I know that we should be the one to discipline our kids and not let them like Eli in the Bible who didn’t restrain his children when needed be. We know that as God entrusts a child to our care, there’s a lot of responsibilities and we are ready for that. My thoughts would go as far as my third baby would be playing either a cello or piano. I know very well that kuya Ad and ate Mich would influence our baby. We will home school the baby early and Michelle was so excited to think about it. Wherever we go I start looking for a baby proof place. In church, we imagine our first few years sitting on the mother-infant friendly seats. I began looking for changing tables at every restrooms in restaurants and shopping areas we frequent. Wherever we shop, we always look around for baby items. Every Monday my two kids would accompany me walking around the block to have a simple exercise and at the same time celebrating the baby’s weekly growth. But on the 12th week, something unexpected happen… and I could not continue to write until now. Exactly a year ago, I had bleeding that led me to an emergency room of Scripps Mary Birch Hospital. I had the most emotionally and physically painful event in my life. The pain was so intense to the point of passing out. I was given a narcotics-type of pain reliever that caused me severe nausea and headache. I lost the baby, that was the most dreadful thing. Healing is a long process and still ongoing. With a great support from my family, friends and even people I don’t know and the Lord’s healing, I was able to overcome grief. It was such a difficult time for me last year but I was consoled by the dream I had before the miscarriage. In my dream I saw my baby. Face to face with an adorable baby with very expressive smiling eyes, he introduced himself as Luke. Weird, right? How can a baby talk without opening his mouth and introduce himself. Anyway, Luke told me that he is okay and that I don’t have to worry about him. Then I woke up. I was happy that morning and I told everyone I saw the baby’s handsome face but something in me felt that there’s something wrong. I just ignored it and realized it later on. It’s been a year. Everything was by the grace of God at work specially in times of grief. No more flood of tears just tear drops. As early as March, it was decided (by me) that my boys will run 5k this June. Supporting the San Diego Chargers players’ individual foundation, I ran the Philip Rivers 5k before. Now, it’s LaDainian Tomlinson 5k, this time it’s my husband’s turn plus Adrian. I registered them early via Living Social (yes, there’s coupon). It’s Adrian’s 2nd 5k this year so hopefully we will get to convince Mich next time to run too. This 5k run held at Point Loma, San Diego has given support to several children’s charities under The Tomlinson’s Touching Lives Foundation. Trial run by father and son just for picture (above) purposes since we arrived before 7AM to pick up their bibs and packets. Adrian’s bright neon color attire was a smart idea helping me to spot him easily. Below, Adrian sprinted and beat these two guys at the finish line. His time was 27:35. The night before the race, I was preparing in case Laurence backs out. Looking at him (below), he had a blast! Feels great to finish your first 5k. Next time, we will do 10k, then hopefully half marathon. They’re not top finishers. It’s just that every finisher gets a medal. Haha! At least daddy has a souvenir of his first 5k run. He is not a sporty type of person so it’s really a breakthrough. Here, the photographers were having a grand time after a yummy breakfast at Panera, selfie time! Going home, we dropped by Manila Sunset Grill and feasted on Filipino food. Yay! Way to go Champ-o-Rado! Congratulations to our resident genius! We are so glad that you’ve finished your middle school with excellent grades. Your teachers’ comments/feedbacks gave us assurance that you’ll achieve more in the coming years. 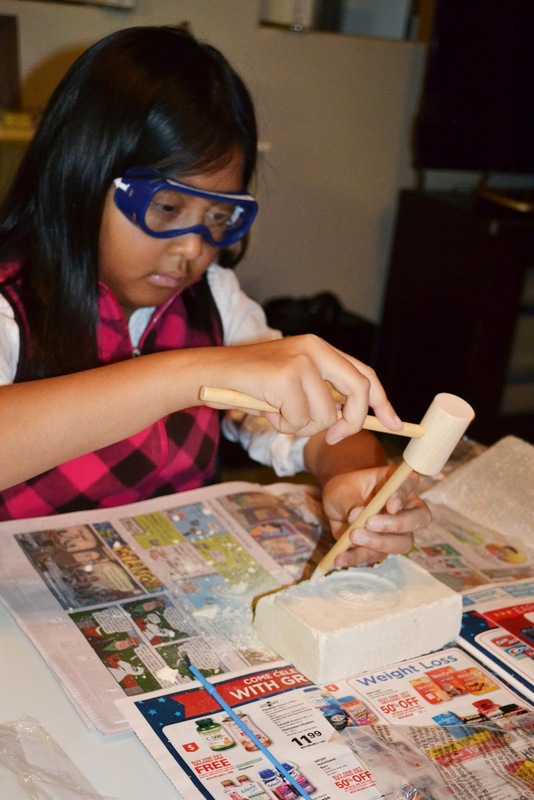 It was an easy transition for you from being home schooled to mingling with many kids in a traditional school. Though I missed the times that we pray for our nation weekly, I know that you’re continuously doing it on a personal basis. If only I could home school you and Mich forever. It’s a privilege for our kids to have been educated in this school where people are excellent and always ready to serve. It was so funny to see the assistant principal (guy on the right) wearing shorts, sando and rubber shoes while arranging the stage prior to the ceremony. It only shows that position doesn’t matter. What matters is how a person can do something without thinking of who he is in his field. This part of California is dominated by Asians, as a proof, here are the asian boys in 8th grade class. I don’t know if these are Adrian’s Starbucks buddies but I know they’re some of his friends. There’s a nearby Starbucks in middle school so that’s their favorite hangout every Thursday. We celebrated over a super late lunch / early dinner with his favorite sister in the world. And his sister made sure that she enjoyed all the food coz she said she had ice cream for lunch in school. Sorry about the pic Ad, the photos of our lunch are all food except this one. Thank you dad! You are most supportive and loving. I know that you always try your best to help us and provide for us. Whenever you talk to me or Mich, you always try to make it as easy to understand for us. I remember all the time we spent doing things like fishing, rc flying, road trips, swimming, hiking and more. I am really happy that you are my dad. I’ll never forget the amount of work you do to provide for us. I also will never forget your support for our interests, even when they don’t exactly interest you. You are a really hard worker too, always reminding us and yourself to do the best we can in whatever were doing. Thank you for helping us in whatever we do and blessing us with the things that we want but don’t need. Happy Father’s Day! I love you. If there are treasures on earth that are so abundant yet so priceless, they are what we call mothers. My mother in-law was an example of a simple person who has an extraordinary mothering skills like that of a mother hen. Her inner strength enabled their family surpass the tests of family life. She may not be healthy all the time but she had a strong sense of care for her family. I’ve seen her qualities through the years and I admire her for that. She may not be perfect as nobody is perfect but the skills of motherhood is overflowing in her life. She devoted herself taking care of her family until the very end, a noble task that many mothers can’t do nowadays. I have vivid memories of her when we went back to Manila two years ago. I’ve seen how happy and content she was being reunited with all of her children and grandchildren. The picture that left an imprint in my mind was when I saw her watching a television show with satisfaction and laughing her heart out alone while everyone was in the living room during her 59th birthday celebration. It was so nice to see a person happy even if we just had a simple celebration. Multiple complications from diabetes and kidney malfunction took her away from us last week. It was a battle of more than a month in the hospital. But God was in the midst of it all. Truly, God’s sufficient grace enabled everyone in the family to do what they can for our mother. And God was so good. We know that she is now enjoying the place where there’s no pain and suffering but pure joy and the presence of our Almighty. We were not able to go back home but we were given the chance to tell her how much we love her, thank her for her life and assure her that we will be living our lives well. I will not forget how we had snacks one time she visited me in my office. That was probably more than 10 years ago. It was unusual to spend time together during office hours but I am glad we did because most of the time we see each other with everyone else around. I thank her for all the time and effort she made for me and my family. I will always remember how she looked after us whenever there’s an event or occasion. She always made sure that we have seats, choicest food and most of all my kids were treated well. During our light moments, mother in-law would always share so many stories about my husband when he was young. It made me feel and see how my husband’s childhood was like. She even gave me my husband’s baby shoes and a toy that we let Adrian play with but unfortunately I was not able to keep. I wish I could at least have taken a photo of those (no phone cameras and selfies yet that time). I have so many things to be grateful for her life but the best legacy given to me was giving birth to my husband and raising him to be a fine, gentle and loving person. Nanay, you are forever in our hearts. It’s been a year since our visit to Seoul, Korea. We’ve watched a lot of Korean dramas that visiting Asia would not be complete without a tour of Seoul and a taste of their dishes. My personal favorite Korean dish is tofu stew. I can skip any Korean dish except this one. When our family decided to abstain from eating out for forty days, I developed this craving for my favorite Korean food. Good thing about living in this part of the world is that Korean market is just around the corner, selling many ingredients. Thanks to recipes online, I can create my soup at home. When we were on tour to different places in Seoul, we tried our best to try Korean food from streets, restaurants and malls. As much as possible we skipped McDonald’s and other common tourist food. We tried what looked appealing to us. 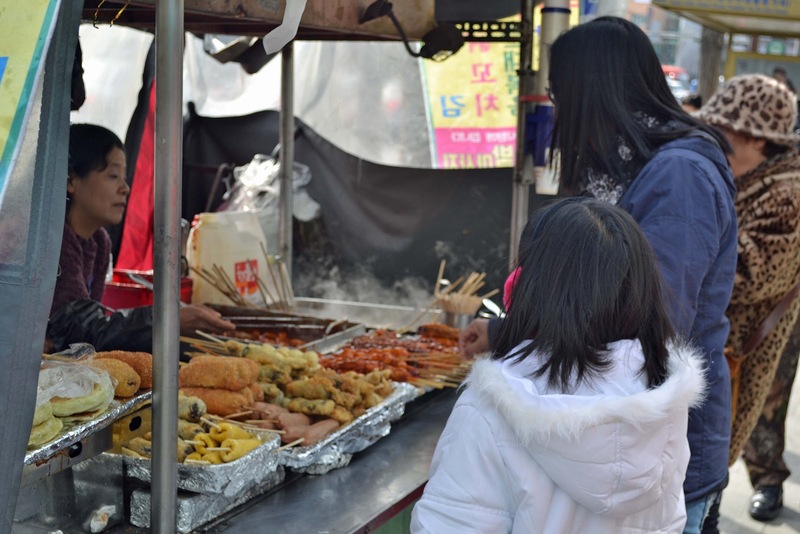 We tried street food where you would just eat whatever you want and pay. 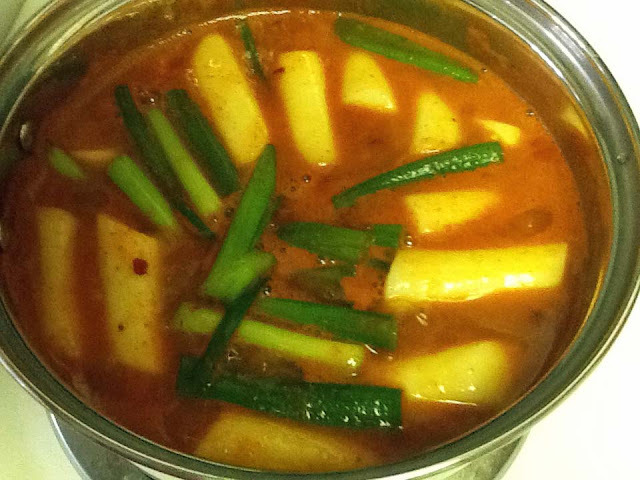 One of them is Deokbokki, a rice cake shaped like a cylinder with hot and spicy sauce. The ahjummas (old ladies) are selling these from enclosed food stalls along the street. But most of the ahjummas don’t speak English. It’s good that when we ate deokbokki and other fish balls in skewers, there’s this young lady that helped us interpret what the ahjumma was saying. We’re not crazy about deokbokki but I can’t help cooking when there are available ingredients and best of all, they’re on sale, nothing to lose. We tried it and it was good, spicy though. I got the recipe from Maangchi. Today is my first time to write my own blog entry. My mom helped me and showed me how to choose the pictures. 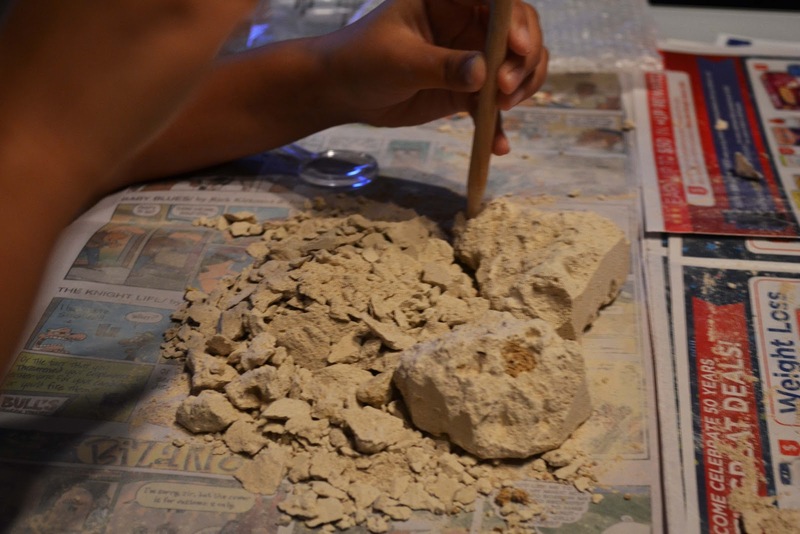 After a few minutes, I found my subject: the time I dug twelve gemstones from a block of sandstone. Here, I started to get in more and more. It took me about ten minutes to find my first gemstone, serpentine. Later, I started finding more and more, until I found all twelve. I was really excited, because I felt like an archaeologist! After a long time of digging, I knew I was getting closer to the finish. I found out that archaeologists really have to work hard, because if they found ancient stuff, they have to dust it with a brush(like me! ), so they won’t break any treasures. I was glad when my brother helped me, even if he found big, broken chunks of rock, and tried to break it. Actually, I don’t even know how long it took me to find all twelve(the picture just shows nine of the rocks), but I know that it took me a very long time! 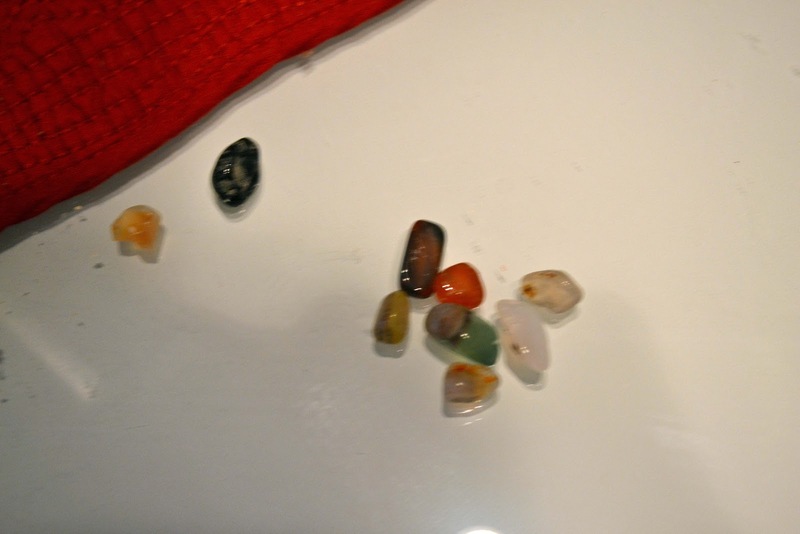 I still had to find two more gemstones, but my dad told me to sleep because it was midnight. So the next morning, I finished the rest, and put all of what I found on a box. When my mom woke up, she didn’t know where I put the gemstones, so she picked up the box, but before she could throw it away, she saw my gemstones fall into the carpet. She only found eleven of it, but then I found the twelfth one next to the sandstone! Also, the gemstones that I found were: One rock crystal, one fluorite, tree rose quartz, one amazonite, one jasper, one serpentine, one sodalite, one agate, and one mahogany obsidian.